The Alawites, a small Levantine minority, have survived persecution and the Crusades to rise to the top and take over the Syrian establishment. Alawite practices, which are said to include celebrating Christmas and the Zoroastrian new year, are little known even to most Muslims. They account for 12% of Syria's population, or just under 3 million people, and yet have been in tight control of a Sunni-majority country, for more than 40 years. 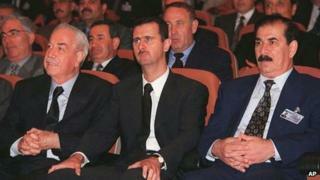 After a coup in 1970, led by President Bashar al-Assad's father Hafez, Alawites consolidated power over Syria's main institutions and security apparatus. Hafez's identity as an Alawite helped him gain the loyalty of other minority groups in Syria, to whom he promised rights and protection. Alawites are seen by other Muslims in the Middle East as very liberal or even secular. In Syria women are not encouraged to wear hejab and many choose not to fast or pray. Some Muslims consider the Alawites a heretic sect. Nusairism, as Alawism was originally called, emerged in the 9th and 10th Centuries in Syria. The word Alawite, or Alawi means "follower of Ali", who was a cousin and son-in-law of the Prophet Muhammad. Shia Muslims also venerate Imam Ali and like the Alawis believe he was the true heir to the Prophet and should have succeeded him. The perception that Alawis regard Ali as a deity or God in human form is what provokes disdain from some orthodox Sunni Muslims. BBC Radio 4's Analysis profiles Syria's Alawis, the sect to which President Assad belongs. They regard the Alawite notion of Ali as heretical and a challenge to the fundamental belief that there is only one indisputable manifestation of God. But some scholars argue this is a misinterpretation and Alawis actually believe Ali to be an essence or form, rather than a human being, through which followers can try to "grasp God". In addition to the main tenets of Islam, Alawis observe two others, "jihad" or struggle and "waliya", the devotion to Imam Ali and his family. Traditionally, many Alawi practices are carried out in secret, in line with the Shia custom of taqiyya, which is the practice of hiding one's beliefs in order to avoid persecution. Syria's Alawis are concentrated mainly on the country's Mediterranean coast, in the port towns of Latakia and Tartous, spreading north across the Turkish border into the province of Hatay and south into northern Lebanon. In recent weeks, sectarian tensions have spilled over into northern Lebanon, sparking fatal clashes between the Alawi minority there, and the surrounding Sunni population who are angered by Bashar al-Assad's brutal crackdown of the uprising. The Syrian government accuses Sunni Islamist groups in Lebanon of supporting anti-government fighters and of planting a series of car bombs in Damascus.